The kebab industry is reported to be worth more than £2.2 billion to the UK economy, so how did the doner kebab become so popular…. Doner kebab, which literally translates to ‘rotating’ ‘roast meat’, is likely to have been consumed since mankind started using fire for cooking around 250,000 years ago. In Sumerian, kabuba means to cook on ember and in Arabic it means to fry meat. It is also considered that kebabs come from the time when Nomadic tribesmen grilled meat on their swords. In his 18th century travel books ‘Ottoman traveler’, Evliya Çelebi mentions kebabs as horizontal stacks of meat. In the 1860s, Iskender Efendi from Bursa contributes to the kebab with a new angle – vertical grilling and serving it in thin slices. Whatever the origins of the doner Kebab, it is hard to ignore its popularity here in the United Kingdom. 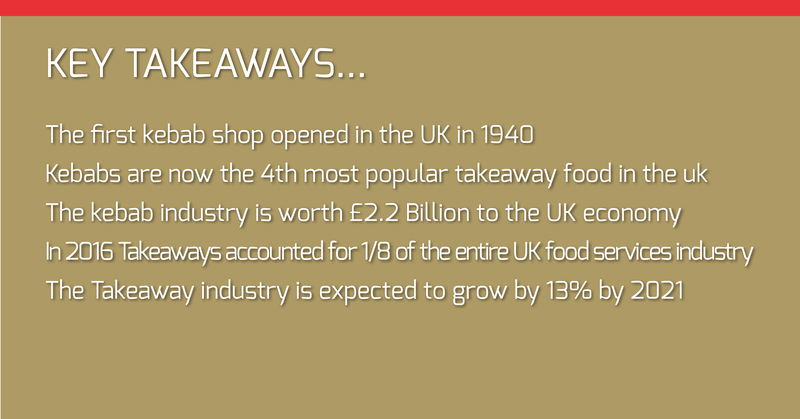 Since the around the 1970’s & 80’s, it has become ‘the’ takeaway meal of choice for party goers up and down the land. Although the doner kebabs popularity shot up since the 1970’s, according to reports, Kebabs first appeared in the UK in the 1940’s as immigrants from Turkish, Cypriot and Kurdish communities arrived in search of a new life. First generation immigrants increasingly brought their families over to settle with them and by 2011, the census estimated that the UK population of Turkish, Cypriot and Kurdish communities numbered at least 500,000 people. As with all migrant populations, the people of these communities brought their customs and cultural influences with them, including the Doner Kebab. The first UK kebab shop is reported to have opened in London in 1940. The Istanbul Restaurant in Soho is likely to have served kebab meat, roasted on a horizontal spit and served with traditional accompaniments including rice and salad. It wasn’t until 1966 that the famous doner kebab – cooked on a vertical spit – first appeared with the opening of the Hodja Nasreddin Kebab House by Çetin Bukey and Kojay Hüseyin in North London’s Newington Green. 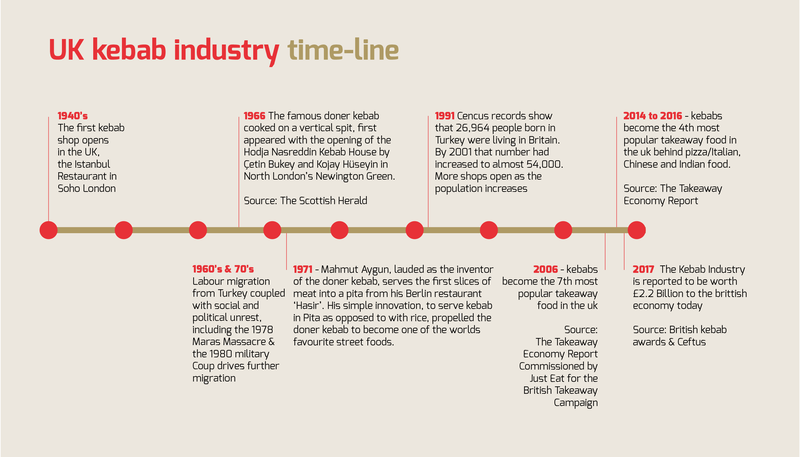 On March 2nd 1971 – Mahmut Aygun, lauded as the inventor of the doner kebab, is said to have served the first slices of meat into a flat bread from his Berlin restaurant ‘Hasir’. His simple innovation, to serve kebab in bread, as opposed to with rice, made the meal mobile and propelled the doner kebab to become one of the world’s favourite street foods. Aygun, who died in 2013 at the age of 80 is also said to have invented the popular yogurt sauce that accompanies the doner kebab. Although many seem unconvinced by Aygun’s claim to have invented what is essentially a sandwich, in 2011 a Berlin-based organisation called the Association of Turkish Doner Manufacturers made it official, and so it passed into history. 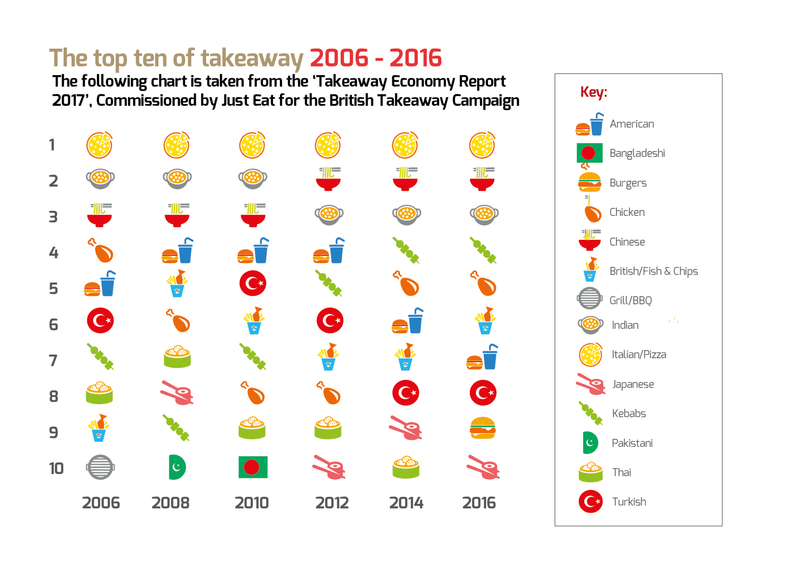 By 2006, kebabs had become the 7th most popular takeaway food in the UK, but demand continued to grow and between 2014 and 2016 Kebabs made it to the 4th most popular takeaway food in the UK behind pizza/Italian, Chinese and Indian food. Today, the Kebab Industry is reportedly worth £2.2 Billion to the British economy, employs thousands of people and has become an integral part of British Culture.